A 75-year-old woman has died after the ambulance she was a patient in crashed in Lincolnshire. It happened at about 03:00 GMT near the junction with High Ferry Lane on the A16 Boston Road at Sibsey. Two male ambulance service staff, aged 62 and 52, were taken to Boston's Pilgrim Hospital and treated for minor injuries. The woman was pronounced dead at the scene. Police have appealed for witnesses. 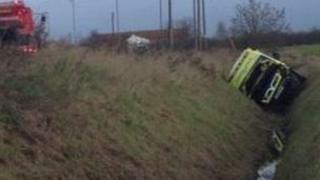 The road was closed while investigations were carried out and the ambulance, which landed in a ditch, was removed. The road reopened to traffic at 13:00 GMT. A spokesman for East Midlands Ambulance Service said the ambulance did not have its blue lights flashing at the time of the accident and had been travelling "at normal road speed". In a statement, the ambulance service said: "One of our double crewed ambulances was involved in a road traffic collision just before 3am this morning on the A16 Boston Road, Lincolnshire. "The vehicle contained two of our ambulance crew and a patient who was being taken to hospital. No other vehicle was involved. "The incident is subject to a police investigation and therefore it is not appropriate for us to make further comment at this time."